They look like torpedoes, but their mission isn’t destruction. 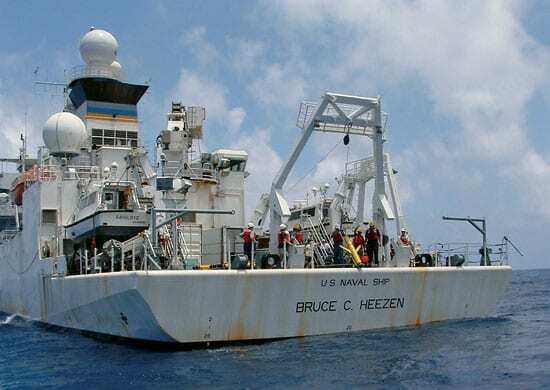 In the mid-1990s, the Navy began funding research for small, robotic vehicles to perform unmanned reconnaissance in coastal waters. At WHOI, that helped spark the development of REMUS (Remote Environmental Monitoring UnitS), designed and built by Chris von Alt, Ben Allen, and colleagues in the Oceanographic Systems Laboratory. Launched on pre-programmed underwater flight patterns and equipped with a changeable array of sensors, REMUS can map the seafloor or collect data on temperature, salinity, currents, phytoplankton abundance, and other seawater properties. The 5-foot-long, 80-pound vehicle can be launched and recovered by two people from a small boat, without a crane or special handling equipment. Easily programmed, REMUS can work alone for more than 20 hours before its batteries need recharging. It can travel at speeds up to 2.5 meters per second and to depths of 100 meters. 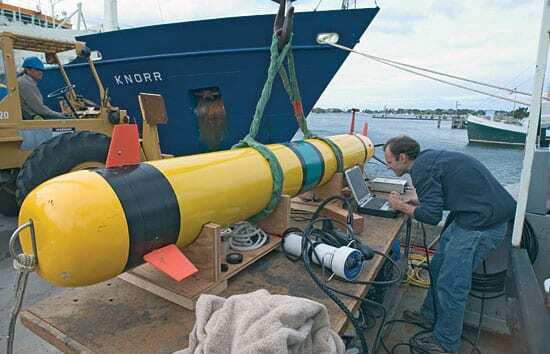 The Office of Naval Research also has funded Dave Fratantoni and colleagues at WHOI to develop another small, easy-to-deploy surveying technology—the glider. Gliders employ an internal displacement piston or an oil bladder to change their buoyancy. They now sink up to 200 meters (656 feet) in the ocean and then rise again to the surface, but vehicles under development will be able to dive ten times deeper. Gliders fly in a saw-tooth pattern, measuring ocean properties and surfacing periodically to transmit data via satellite to scientists on ship or shore. They are slower than REMUS, but they can remain on the job for several months. Valuable to the Navy, these new-generation undersea robots are also having productive non-military careers in the service of scientists exploring a wide range of ocean phenomena.